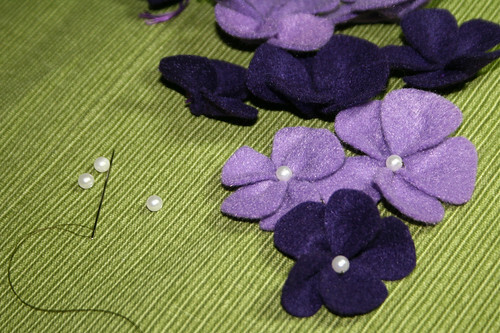 If you window shop at etsy or just go out where people are you will have noticed that felt flowers are all the rage. If you google "how to make felt flowers" you'll get almost 5 million results. I would say that makes them pretty popular. The nice thing is they're pretty easy to make. I decided since I have a new job at church that I needed a new bag. After all I will be hauling all kinds of things to church with me now. I found some fabric last weekend and decided it needed a little something to accessorize it. This is where the felt flowers come in. I did my search. I looked at the images, it was much easier to pick that way. I thought about this one. It was lovely but not really what I wanted for this bag. I'm sure I'll make it some other time. I kept looking. Then I found this one. Yep, that's the one. So yesterday and today I've been tracing, cutting, stringing, and then attaching. Those are darling. I can't wait to see the bag!